The former Prush Confederacy, previously and currently the Prush Empire, was the nation south of Antiford across the Prodigious Canyon. United in 1659 by a clan of desert warriors named the Prushazzia, they conquered the area that is known as the classical Prush Empire. Shortly thereafter, the old leader died and Con VonKresser brutally grabbed power in the region. 1683 Con VonKresser died and gave his lands to his only son, Erick VonKresser who brought the name of Prush to the areas under their rule. The Prush Empire was fully constructed in 1730. The ruling family of VonKresser recognized themselves as traditional Prush, instead of the Techno-Prush of the south. In 1820, war broke out between The Prush Empire and southern desert tribes of Vibranni, lasting 4 years and end with a Prush victory. After the war, the VonKresser family were called butchers by the south due to resentment over heavier southern/Techno-Prush wartime casualties. In 1842, a new group of Prush rise, named the Aristocratic Prush, consisting of Techno Prush who moved into north to participate in central government. This group became the second most powerful in Prush, just under the Royal family. In 1879 war broke out between Antiford and The Prush Empire. 1882 the Techno-Prush had their own revolution alongside Antiford's lasting the last year of the conflict resulting in and a complete restructuring of the region. The south broke ties with the Prush Empire and started two countries, Mercia and Prushland. The end of the war saw the loss of rights for either nation to the Prodigious Canyon. The left over Lands turned into the Prush Confederacy. 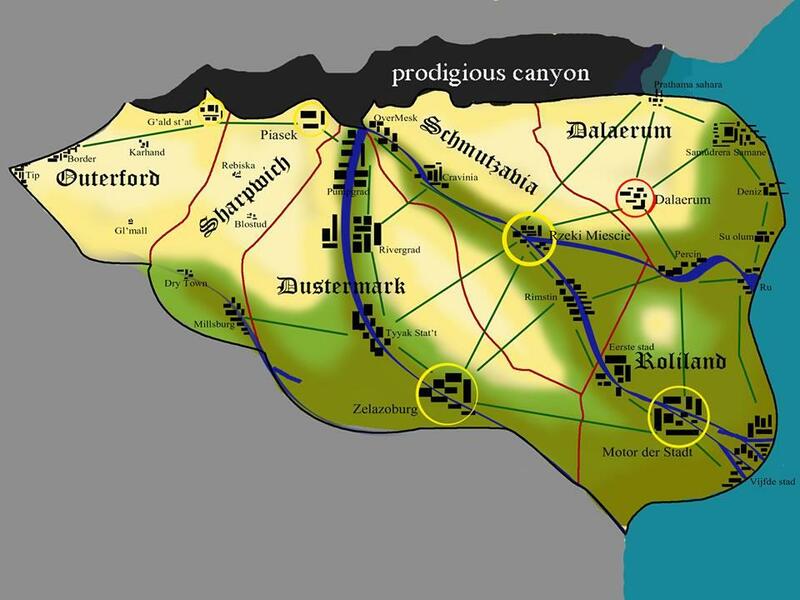 The Aristocrat Prush rule from there Government Palaces in Dalaerum, and the rest of the confederacy is left in chaos. The military arm of the government is made up of mostly Techno-Prush, their chief job is to take in money and to police the Traditional Prush people.